Konnichiwa! Welcome to Tokyo, the capital of Japan. Tokyo is an eclectic blend of innovative modern fused with ancient and traditional. Shimmering glass skyscrapers sit side by side with centuries old temples and shrines, and the busy streets are alive with pulsing Tokyo life. On arrival at the airport, you will be met and transferred to your hotel. This evening, meet your Tour Director for a tour briefing and welcome dinner. Today you will get to know why Tokyo is a famous city of contrasts. Begin your exploration of Tokyo with a visit to the famous Meiji Shrine, dedicated to the spirits of Emperor Meiji and Empress Shoken. Next, be taken to the 238m tall Roppongi Hills Observation Deck for spectacular views of the city. Head across town to Asakusa, Tokyo’s old town where you can soak up the atmosphere of what Tokyo must have been like hundreds of years ago. Visit Sensoji, Tokyo’s oldest temple and stroll through the surrounding streets. Drive north to Nikko, which has been the centre of Shinto and Buddhist worship for many centuries. Visit to the Toshogu Shrine complex, built as a mausoleum for Tokugawa Ieyasu, founder of the Tokugawa Shogunate that ruled Japan for over 250 years. It is a lavishly decorated shrine complex in a beautiful forest setting. Proceed to Chuzenji Lake, and the beautiful Kegon Waterfall sitting in the mountains above Nikko. Travel to Hakone, if luck is on your side you may be able to see the legendary Mt. Fuji. The first stop is the Hakone shrine. This Shinto shrine was very popular among Samurai during the twelfth century and is hidden away in a dense forest. Drive to Lake Ashi and take a novel ride across the lake on board a Pirate Boat*. After disembarking, continue our adventure via Ropeway enjoying views of the Owakudani Valley. Spectacular views of Mt. Fuji can also be seen on a clear day. You’re Invited: Tonight, live like a local by staying in a Japanese ryokan sleeping on futons laid out on tatami mats. Relax as you travel through the stunning mountain scenery to Takayama. Takayama retains a traditional touch like few other Japanese cities, especially in its beautifully preserved old town. Today is full of cultural immersion starting with a visit to the Miyagawa morning market. This is one of Japan’s biggest morning markets with stalls selling various local crafts and produce. Head to Takayama Jinya, also known as the Historical Government House. For almost two centuries this building served as a local government office and it is the only surviving government building from the Edo period. Continue to Matsuri-no-Mori Festival Museum that showcases the key aspects of the Takayama Festival, one of Japan’s major festivals. You’re Invited: Visit Hida Folk Village, an open-air museum exhibiting over 30 traditional houses from the mountainous region around Takayama. Join a local expert and learn the craft of making the cute sarubobo dolls, the perfect souvenir to take home. Continue through mountain scenery stopping at the village of Shirakawa-go. It is famous for its traditional thatched roofed farmhouses, some of which are more than 250 years old. Learn about the history and customs of the people while taking a relaxing stroll around the village. Drive to Kanazawa and visit Kenroku-en Garden, one of Japan’s most beautiful gardens. The legend of the Samurai is still strong throughout Japan and Kanazawa has one of the best surviving Samurai districts, the Nagamachi Samurai District. Here we visit the Nomura Samurai House, an authentic Samurai house and museum to learn about these skilled and fearsome warriors. Board the JR Limited express train bound for Kyoto. Being the former capital and home of the Emperor, it is famous for exquisite castles and imperial palaces, as well as elaborate and ornate Buddhist temples and Shinto shrines. Be led on a walking tour of the Higashiyama district. Admire the picture-perfect streets lined with teahouses and artisan shops. The Kiyomizu temple, with a 13-meter-high veranda of the Temple’s Main Hall offers an amazing view of Kyoto and was built without using a single nail. You’re Invited: Experience a traditional Japanese tea ceremony at a temple. A tea master will demonstrate how to prepare for a tea ceremony, how to conduct as a host and of course how to make a bowl of green tea. Nijo Castle was built in 1603 as the Kyoto residence of Tokugawa Ieyasu, the first Shogun of the Edo Period. The ornamental building is well known for its Momoyama architecture, decorated sliding doors, and ‘chirping’ nightingale floors. Be taken to Kinkakuji, also known as the Golden Pavilion. Originally built as a retirement villa for the Shogun, it is now a Buddhist Temple. It is a remarkable sight with its shimmering top two floors being completely covered in gold leaf. You’re Invited: Visit the nearby town of Arashiyama which contains the magnificent Tenryuji temple, one of Kyoto’s largest and most impressive temples. Enjoy a unique experience as you are invited to partake in a special temple lunch. Afterwards, explore the temple buildings and wander the beautiful gardens. Take the path through Arashiyama’s famous bamboo groves, and end at the Nonomiya shrine. You’re Invited: Experience Kyoto like a local. Jump on board your rickshaw and enjoy this fun and traditional mode of transport while your driver pulls you from the bamboo groves to Togetsu Bridge. You’re Invited: Tonight you will have the honour of taking part in a traditional Japanese dinner with a maiko (apprentice geisha). Geisha’s have entertained the elite in Kyoto for centuries. They undergo strict training in the traditional Japanese arts such as music, song and dance to ensure they are the perfect dining hosts. Dinner with a maiko is not only steeped in tradition but is fun and fascinating. Drive to the town of Nara. During the eighth century, Nara was Japan’s capital and many of the temples and shrines built at that time still stand today. Visit Todaiji temple, one of the world’s largest wooden structures and home to Japan’s largest Buddha. The park surrounding the temple is referred to as “Deer Park” due to the large population of deer who roam freely. Next stop is Nara’s most celebrated shrine, Kasuga Taisha, famous for its hundreds of bronze and stone lanterns. From Nara, travel to the iconic Fushimi Inari Shrine. Featured in the movie “Memoirs of a Geisha”, this shrine is known for its thousands of red torii gates leading up and through the sacred forest of Mount Inari. This is a highlight of any visit to Japan. Morning free in Kyoto before departing. Discover More: Learn the samurai way with a Samurai Kembu Lesson (additional cost). All aboard the high speed bullet train (Shinkansen) to Hiroshima. Sit back and take an experience like no other with a ride on this amazing engineering marvel. Hiroshima is unenviably remembered for the atomic bomb that was dropped during WWII. Peace Memorial Park and museum stand as a stark reminder of the devastation caused, but also the progress made. 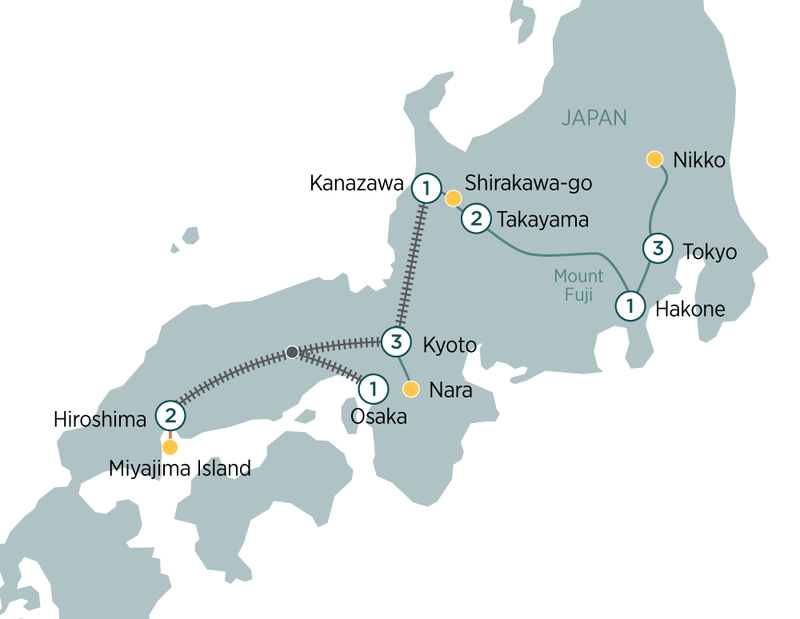 Travel by local train to board a ferry to Miyajima Island. This is a small sacred island located in the Inland Sea and has been a holy place of Shintoism since the earliest times. Here you will find perhaps the most photographed site in Japan; The Floating Torii Gate. Take the ferry back and transfer to Peace Memorial Park on a relaxing boat trip. This park is dedicated to the legacy of Hiroshima as the first city in history to suffer a nuclear attack. The park’s main attraction is the Peace Memorial Museum, which provides an opportunity to learn about the devastating effects the A-bomb had on the city of Hiroshima and its people. After visiting the museum, take a local tram back to your hotel. Reboard the high-speed bullet train bound for Osaka for your final adventure on this remarkable train. On arrival in Osaka, be taken on a city tour. First stop is the majestic Osaka Castle, one of Japan’s most famous castles. The contrast between the old Osaka Castle park with its large stone walls and the surrounding skyscrapers provides an excellent example of the balance between modern Japan and its rich cultural heritage. Continue to Dotonbori district and stop at the Umeda Sky Building. Here enjoy unobstructed 360-degree view of Osaka from the open-air observatory. Tonight enjoy a farewell dinner with your newfound friends. Transfer to the airport for your departure flight^. We hope you enjoyed your visit to Japan and look forward to welcoming you back on another Evergreen cruise or tour. Sayonara!